Alex, Matei and Bogdan are three passionate bikers from Bucharest. They are are going to pedal 620 km from the capital to Bonțida, Cluj. Their team is wearing the name of an independent bike and coffee shop which they’re representing during their journey. This 670 km road would be the biggest adventure ever. I find it a perfect opportunity to test boundaries, and the final destination is a very strong motivation (Matei). Alex Took part in MTB competitions and Bogdan has been a bicycle mechanic for 10 years. Matei began playing Bike Polo 4 years ago and represented Romania at 2 European championships and 6 other international ones. This year, he will represent Romania again along with two other teammates. This simple construction called bicycle seems to be the answer to an increasingly complicated problem (Matei). See that black beauty that Bogdan is holding (right-hand side)? Its name is Iute Bike and is meticulously crafted by Atelier Pinion. They were nice enough to give one away as the prize of the ECO Game this year. Being conscious about the carbon footprint produced by burning fuel, this cause is really important to them. Atelier Pinion wants to draw attention to the possibility of alternative means of transportation for long distances. They think that those develop an adventurous spirit and a great physical condition for the rider. Needless to say, they also bring plenty of fun! They promised they’ll tell us all about their trip when they get to the castle. Support their cause by riding your bike to work every day! With all these benefits (and no disadvantages whatsoever), who wouldn’t consider leaving their car at home? Say hello to Bogdan, Boti, Andrei and Tudor, these four young lads from Cluj-Napoca! For them, loving cycling is a job for which they don’t want to be paid. They’re going to pedal around 350 km from Oradea to Debrecen and then back to Bonțida, Cluj. I think we did a pretty good job last year when we cycled from Bucharest to EC (Tudor). Cluj Fixed Gear ready to prove a fix is the best partner even on a long ride. 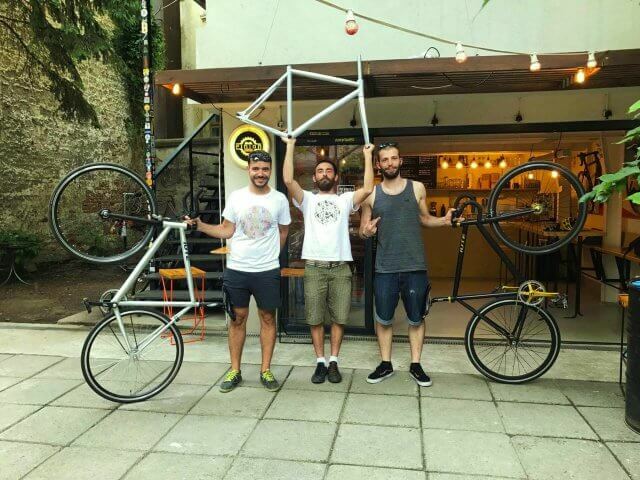 Cluj Fixed Gear wants to tell the world about NOD Makerspace, the first major creative community center in Romania launched in 2015. NOD works to democratize design, engineering, manufacturing and creative education. The project aims to support the projects of its members: anyone who has an idea, wants to develop an invention or build a prototype, finds tools and special equipment that are difficult to access on his/her own at Nod (laser engraving & cutting, 3D printing, CNC router, plotter, ceramic oven, wood and metal processing equipment) as well as a community of people with experience and enthusiasm. NOD Makerspace is a technical partner of MAINOI being the builders of the bicycles installation where you can pedal to produce energy and charge your phones in the camping this year. Also, the main purpose of their trip is to promote a cause they care about: MATER – Library of Materials. For everyone who wants to help, chip in with a donation for the MATER Project here: https://www.startarium.ro/crowdfunding/mater or spread the word about it on social media. 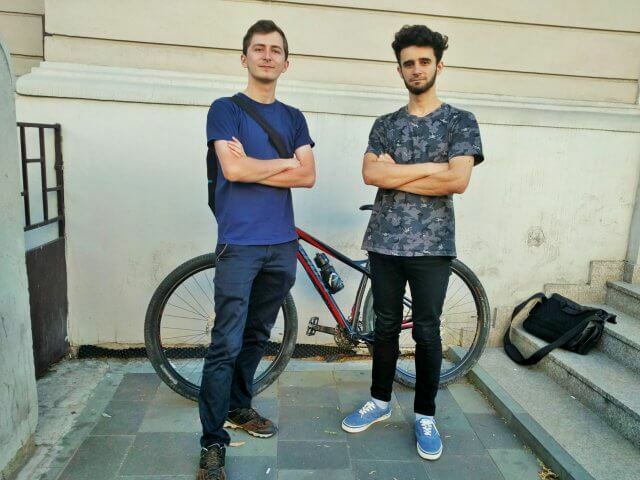 Three tech-savvy, bike riding, technology loving guys – the perfect description for Laszlo, Constantin and Iulia (she’s not in the picture but she’ll definitely join in), who form together ChimpBike team. 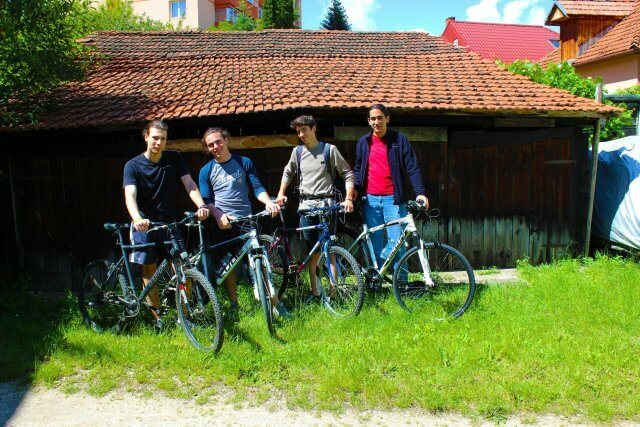 They are going to pedal 300 km from Sibiu to Bonțida, Cluj for the Electric Castle Festival to promote Ride2Work. I’ve spent 2 years in Copenhagen where I was commuting 40 km, 5 days/week (Iulia). Chimp Bike supports cycling as being the most efficient means of transportation, despite all the technology existing today. They swear that riding a bike for a few minutes a day comes with huge advantages both for health and for our planet, so they encourage people to think twice when they are settled on taking a car or cab when going to work/school/wherever. The thrill, the fun, the rush, the idea of doing the right thing for you and for this world will get you hooked after a couple of rides (ChimpBike). ChimpBike would love it if you would support their cause by giving your bike a dust-off and taking it out on the road. They swear that everything on this Earth will be grateful for it, and that you’ll definitely enjoy it: Guaranteed satisfaction, money-back policy! 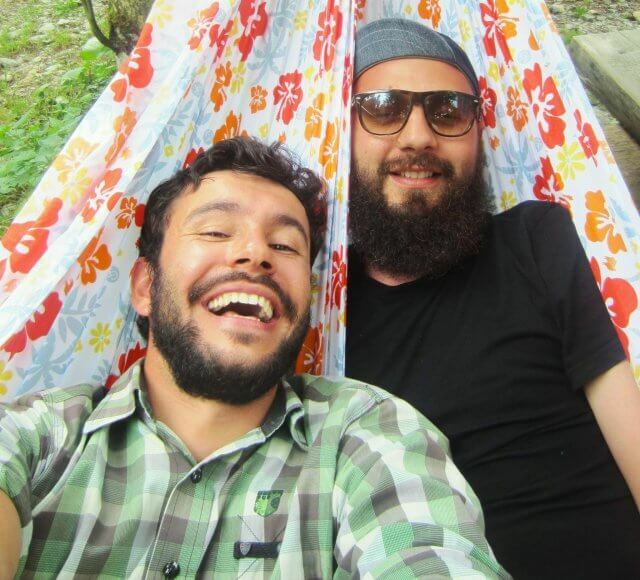 Formed of Andrei (Hatze) and Andrei (Ciudatu’), Doi La Pedale are going to pedal 400 km from Curtea de Argeș City to Bontida, Cluj for the Electric Castle Festival. Even though the name of the group gives away only two members, Daniel (Cânele) will join them during their trip and become the third wheel, as he confessed with lots of auto-irony. The crew is promoting “Cu Verdele-n Sus”, an eco-friendly NGO and other two NGOs that support social awareness on people with disabilities. These organizations are important to them because they’re fighting against the deforestation in the Sibiu County. They are relentlessly drawing attention to the whole disaster regarding the illegal tree cutting in Romania and they also involve the disabled people by offering them a chance to join the anti-pollution movement. 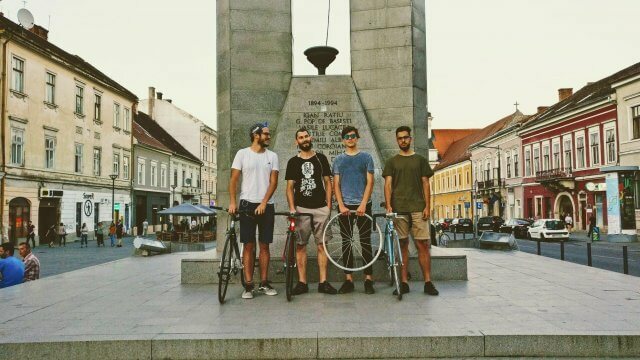 Ștefan, Laurențiu, Timotei, Nicolae and Andrei are going to pedal 251 km from Brașov City to Bonțida, Cluj for Electric Castle Festival. I’ve been training there for 2 years now and this would be the perfect opportunity to put those years of training to use (Timotei). Their team wants to raise awareness about cigarette butts littering. This cause is important to them because their belief is that cigarette butts are one of the biggest preventable pollution source. 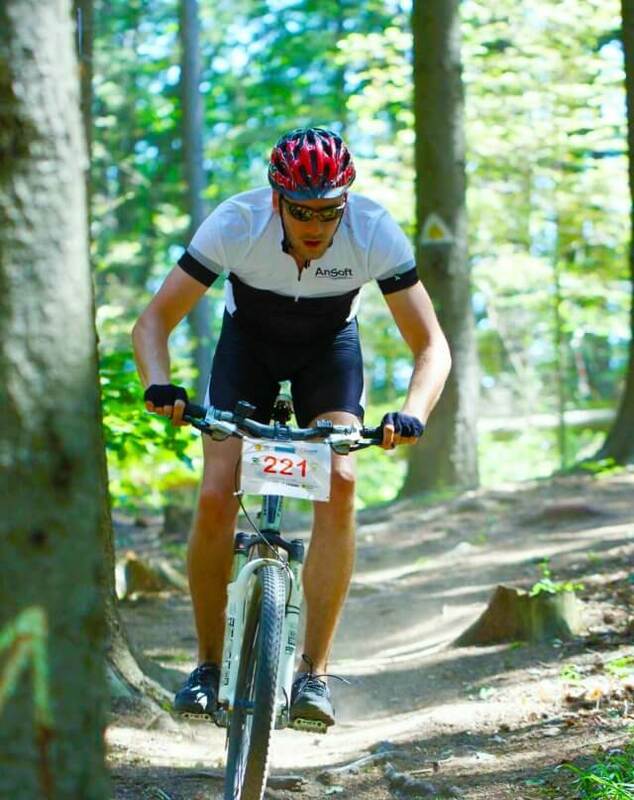 Sergiu is one of the Eco Ambassadors who has decided to ride alone to Electric Castle this year. 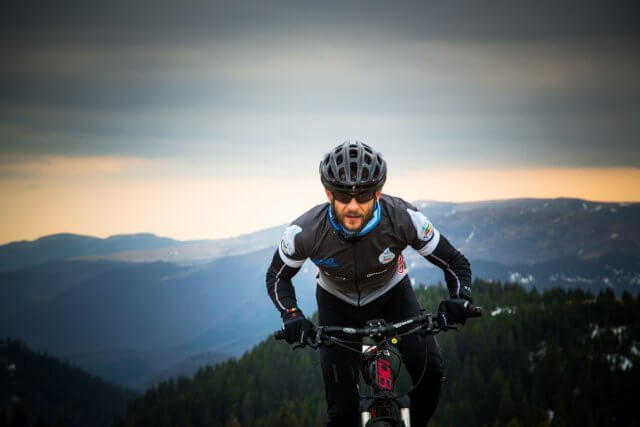 He’s going to pedal 300 km from Omu Peak (2505 m), Bucegi Mountains, to Bonțida, Cluj to promote keeping the Bucegi Natural Park clean. Not disturbing its ecosystem by building heavily and driving motorized vehicles in the area is a really important cause to him. Starting wandering Romania’s mountainside since he was just a child, he lived to watch all the negative transformations of the natural environment evolve. Sergiu wants to draw attention to the fact that many tourists are uneducated in preserving the environment. Also that the local institutions should enforce the law (but they’re outnumbered and poorly paid, thus unmotivated). Due to corruption, a big problem is that building permits are issued for locations inside natural parks, aspect which cause an unbalance in the ecosystem. word of mouth: telling others to do it. Sergiu is a complete rider: a competitor, a commuter and a traveler. Also a lone wolf during this journey, Silviu Martin is going to pedal more than 450 km from Bucharest. He’s promoting cycling as a lifestyle because it has the potential to make people happier and the Planet a better place. Being the owner of a cycling tour company, he says that literally, cycling is his life. I’m a cycling guide and I cycle hundreds of km per week when I’m on my tours. This year, I’m taking part in The Transcontinental Race, a solo cycling race from Belgium to Greece (Silviu). 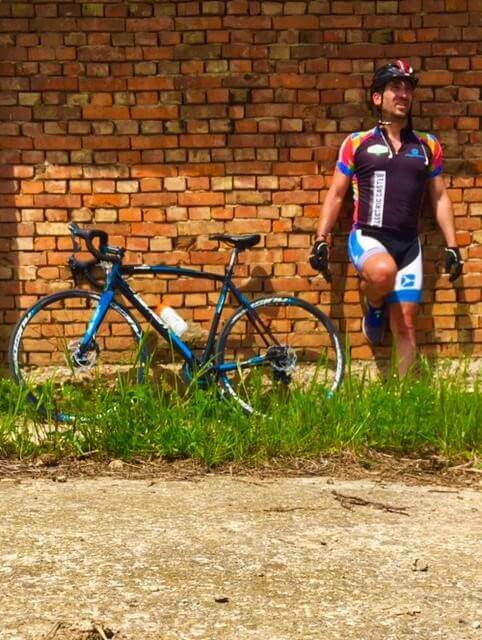 Also a passionate rider, Tiberiu is going to cycle 280 km from Brașov City to Bonțida, Cluj. He will promote nature and especially forest conservation. This cause is important to him because he loves being outdoors and he considers himself responsible to help preserving Romania’s forests. Tiberiu wants to draw attention to the unlawful deforestation that has destroyed thousands of acres of forest in Romania. This is also an appeal to put interests of local communities and nature first. He will appreciate it if you support his cause by putting a little bit of effort into minimizing the impact of your passing each time you walk through a forest. I’ve been pedalling about 15000 km a year for the past 7 years. 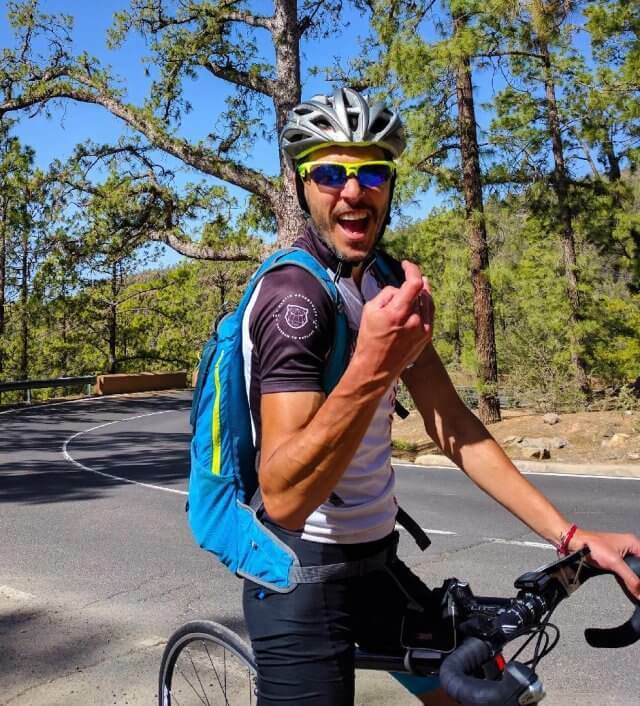 I’m an endurance cyclist 2 time Super Randonneur finishing 200-300-400-600 km brevets twice. I was one of the first romanians to take part in Paris-Brest-Paris race (Cristian). Speaking so dearly about his bicycle, he considers it as being a means of meditation and also his favorite toy. Cristian is deeply involved in social projects. He’s convinced that you can’t hope for a change for the better without investing your time and passion in it. The cause he is rooting for is saving the Romanian forests. This year as an eco-ambassador I want to bring to the forefront the cutting of the forests of our country, a disaster that happens every day and we can stop together (Cristian). Sorin is going to pedal from Arieșeni City to Bonțida to promote Eco Tourism. This cause is important for him because he’s passionate about cycling like every other Eco Ambassador. He would love it if you would support his cause by refusing to drive and choosing a bike instead. On July 12th all the Eco Ambassadors will come together from Cluj to Bonțida. Departure is at 14:00 from Iulius Mall and Devron will accompany all the cyclists from their techical car. Anyone who wants to join them (pedalling, of course) is more than welcome. Many thanks to the sponsors of the initiative! Lidl, global supporter of the ECO program and Devron, technical partner of ECO Ambassadors. Article written by Maria Guță, communication intern.